Quickly connect all your cloud, on-premises, and proprietary systems using Domo’s variety of connector options. Whether your data is in the cloud, on-prem, in a flat file, or all of the above, Domo supports bi-directional connections between all systems. Connect to 600+ plug-and-play API connectors. Connect to secure On-Premises databases with Domo Workbench. Connect to Excel, CSV, and Google docs in seconds. Connect to an endless selection of data sources. Take a Federated approach and query the data directly from where it is hosted. Connect to secure data stored in your data warehouse or data lake. Hundreds of pre-built APIs, activated in minutes. With 600+ plug-and-play connectors and hundreds of ways to connect to your data, Domo eliminates time-consuming and costly engineering projects. See performance unfold in real time. Let Domo manage and maintain API connections to your most important cloud data sources so your teams don’t have to. Direct-from-source data allows for real-time reporting. When underlying data sets change, everything is updated accordingly. Plug in your username and password, decide what data you want to connect to, and you’re up and running instantly. "Domo is one of those platforms where the power is within the connectors. You could literally get a subscription to Domo tomorrow, plug in five to ten connectors, and get meaningful data by the end of the day." Leave your data on-premises or migrate it to the cloud with Domo Workbench. If you have data on-premises and in the cloud, Domo allows you to take a hybrid approach, and encrypts and protects sensitive data. 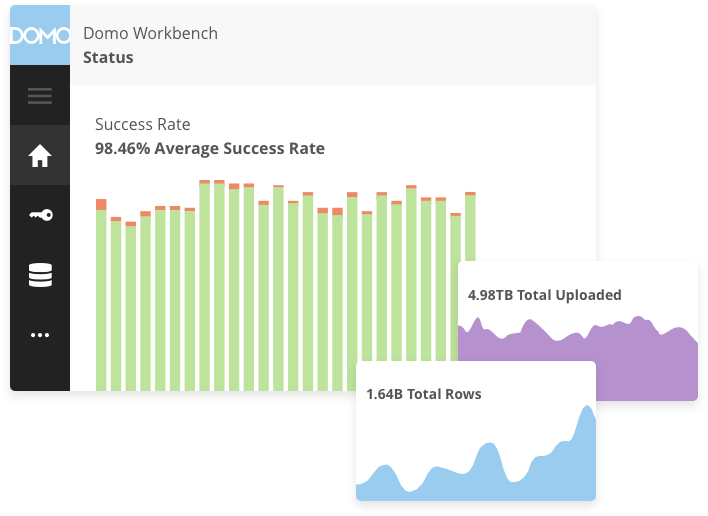 Workbench provides a secure, client-side solution for uploading your on-premise data to Domo. Hundreds of pre-built, on-prem connectors. Quickly connect into common on-prem data sources like ODBC, XML, SAP, JIRA, QuickBooks, and more. Securely connect to on-prem data. Encrypt, protect, and govern your most sensitive data sets like PII, PHI, or HIPAA. Scale multiple jobs, each with millions of rows. Connect to data at scale and get Workbench notifications to alert you in real time when jobs succeed or fail. Out of spreadsheets. Into Domo. Domo enables you to pull Excel spreadsheets—along with data from any other source—into a single, cloud-based platform, allowing you to see the data you care about, in context. Eliminate time consuming, error-prone manual processes. Easily collaborate and act around the data you care about most. See a faster data turnaround time for the people who rely on it to make decisions. Turn your static spreadsheet data dynamic. With Domo, manual tasks that took hours now take minutes, data is dynamically refreshed, and reports are easily and instantly shared. Upload files of any size instantly. Connect to all of your files quickly and see faster data turnaround time for faster decision-making. Ensure your teams are all on the same page. Enable your entire team to work from a common data set instead of emailing around hard-to-govern spreadsheets. Spot patterns at a glance with real-time KPI dashboards. Gain end-to-end metric visibility with dynamic, easy-to-consume data visualizations. "Domo connected to our legacy data system within four or five minutes. They can really walk the talk." Connect to any proprietary system, any way you like. There’s no data set we don’t love. Domo has hundreds of ways to connect to different data sets, and we love them all. Empower your users to take immediate action on your data with Domo's open design that connects any systems with Domo as the hub between them. Build your own connection into Domo using our secure, proprietary SDKs. The quickest way to begin developing on the Domo platform is through our two officially supported API libraries in Python and Java. The Command Line interface simplifies access to the Domo API and is a massively scalable way to quickly load large data sets into and out of Domo, particularly when first migrating data to and from Domo. Connect to any device in your network that produces IoT data, such as point-of-sale systems or smart vending machines. Take action on that data and send messages to those devices with write-back capabilities. Need a unique cloud connection that isn’t currently available? You can create your own connector with the Connector Dev Studio for exclusive use or to add to the community of existing connectors. Use simple HTTP server-to-server callbacks to connect data between various applications using Domo. "To the extent we can have Domo help us connect to all of our other applications, that's going to be a big deal. Both ways, not just from the application to Domo, but back again to orchestrate the behavior." Connecting securely to data lakes and data warehouses. If you’ve invested heavily in your current storage, Domo enables you to bypass cloud connectors and query data directly from where you’ve already hosted it. Why duplicate parts of your data lake if you don’t have to? Federated adapters translate Domo queries to the language of your existing databases. Connect instantly using data federation. Secure connections, persistent sockets, and dynamic load balancing dramatically reduce response latency. Control how your data is transported. A cache of your data is kept just long enough to render data visualizations through a customizable time-to-live. Governance, security, and control at all times. Data is protected in all lifecycle stages, and admins control which tables are approved for external access. "Chief Digital Officer tracked 20k+ data sources in real time to see performance across digital media for real-time decisions on where to spend, contributing to $2.1B in ecommerce revenue in 2017."